The necklace was in good condition when it arrived but unfortunately the gold color wore off after wearing it for a bit - even though ithe seller claims it would not wear off. I didn't wear it in the shower or to bed to avoid discoloration. I contacted the seller about this and they weren't very cooperative so I had to escalate the case to Etsy. I am somewhat happy with the product but I am leaving 2 stars because of the lack of cooperation with the seller (stopped answering my messages). To my opinion the item does not seem to be handmade. Worst of worst buyer ever. The fact is you got it a month ago, you damaged the item and abused the Etsy case. We answered all of your messages nicely but you repeated same message over and over. Fortunately 99% our buyers are great unlike you. This is fraud and scam. You should pay if you damaged the item. Do not do the same thing to other Etsy sellers even though that's the only way how you live your life. 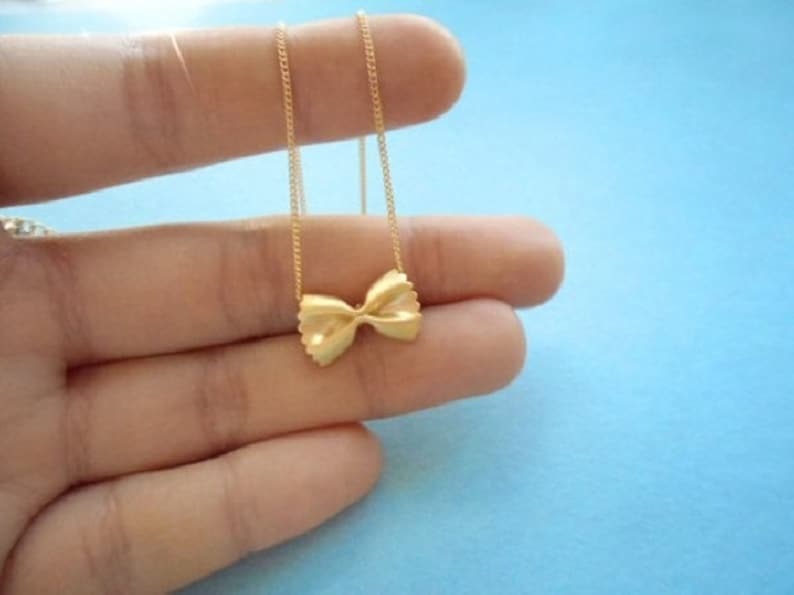 The cutest necklace ever. I wish the rose gold had an even coating but this does give it a bit of a rustic look. Thank you! ✰ If it is defective or damaged, you can return it within 7 days of receiving your purchase, but make sure that buyer should return the item with regular mail, if buyer returns the item with Priority, Expedited, or Express, that cost will be "buyer's responsibility"
✰ You CANNOT return it because of wrong size or change of your mind as all items are handmade to order item. ✰ Please, allow us 1-3 business days to ship out your item as all items are handmade. We ship your item via Canada Post upon receipt of your payment. ✰ Please note that you may get shipping notification email 1-2 day earlier than actual shipping date as sometimes we mark your item as shipped when we finish preparing for material for your item, but we still will ship your item within 3 business days upon your payment. ✰ We cannot guarantee the successful delivery for some countries such as all of middle east countries, South America, East Europe, Russia and Southeast Asia countries. Buyers in these regions should discuss about delivery way with us first before placing an order, otherwise, we will cancel your order. ✰ Buyers are responsible for any custom/ taxes for the item. Each country has a different custom policy, for more information, refer to your local custom. First of all, we really appreciate 99% awesome buyers all over the world, God bless you. We are sure your life is also beautiful. Some of these FAQs are for the rest 1% ugly scammers, these 1% scammers should read our FAQ very carefully. 1. I haven't receive the item yet, where is it now? ✰ We ship your item with regular air mail w/o tracking number unless you choose shipping upgrade options when you check out, but don't worry, we have a special contract with a post office, your package(including international package) is supposed to return to me if something is wrong with the address or recipient. As long as you gave us a correct shipping address, you will 100% receive it safely. We really appreciate your patience. 2. Why there is no tracking number? ✰ If you don't choose shipping upgrade option, your package will go to your mail box directly w/o tracking number, if you need to track it, buy a shipping upgrade option when you check out. 3. It's been 14 days since I ordered, but not received yet, why? ✰ We need 1-3 business days to ship out the item as all items are handmade. It will take another 7-14 BUSINESS DAYS to US and Canada, 2-5 weeks to other countries NOT calendar days. But this is just typical time line. Sometimes your package can take longer than this time line due to local weather or other reasons. Whatever shipping option you choose, we don't guarantee the delivery date as it is beyond our control once I ship out. Some bad people(only a very small minority of people) ask us refund when package doesn't arrive by the time they choose. These people don't even return the package when they get it later. We are not a post office, sometimes your package may be delayed, you should be patient. This is recent new type of buying fraud. The information of these people will go to our scammer DB immediately. 4. I receive the package safely, but you didn't give me a tracking number, I think I can lie to you to get another item or refund, can I? ✰ No, you cannot, shame on you! Some bad people think non tracking package can just evaporate, and they think they can abuse this. Actually some do. They just lie to us they didn't receive the item to get refund or get another item. But remember this is why we have a special contract with a post office to prevent these people and crime. What we like to suggest these people is just working extra 1 hour. The price range of my item is normally around $20, this is not a huge deal, don't sell your soul just for a few bucks! work extra one hour! this is a fraud and crime! DO NOT EVEN TRY, we can figure out if you lie or not with over 10 year experience. Your information will go to our scammer DB immediately. 5. I gave you a wrong shipping address, so I haven't receive the item, but anyway it is true I haven't received the item whatever reason it is, so I just like to hide my mistake, and lie to you to get the item or refund, can I? ✰ We are supposed to ship the item to the address buyer give us. If item goes to somewhere else by your mistake, it is your responsibility. 99% not receiving issue is because buyer gave us a wrong address. Remember that's your responsibility! ✰ Be good, it is just childish threatening, delivery time is beyond our control once we ship out, you should be patient and you must return your package first to get refund. As soon as we receive your return, we will refund your money right away. If you cannot be patient, we strongly recommend you to buy the item in your local market. 7. Some bad people damage the package or claim some parts are missing on purpose to get another item or get refund after they got safely, every item come in a custom made packaging to protect the item, DO NOT try to lie to us, your information will go to our scammer DB immediately. 8. Do you sell pendant or chain separately? 9. Can I request any personalization for all items? ✰ Personalization depends on each item due to material, technical matter, etc. You should contact us for more details. 10. My item is tarnished, why? Usually, gold filled/ sterling silver items are more tarnish resistant than gold plated/ silver plated, but this doesn't mean they will not be tarnished. We are using the best quality material for every item, but if you throw them in theses environments, they may be tarnished.